This very attractive, beige-and-dark-brown-brick, 35-story apartment tower was erected in 1987 and has 256 rental apartments. It occupies a very prominent corner in the Yorkville neighborhood and has considerable "light-and-air" because two of the three other corners at this intersection are low-rise and the third is an apartment tower set back in a plaza. The building has a stainless-steel entrance marquee, a doorman, a two-story limestone base, nice retail spaces. It has no sidewalk landscaping, no balconies, no garage and no health club, but has many corner windows, excellent local shopping and public transportation. 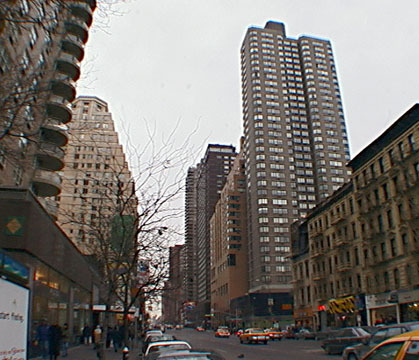 It is close to many of the private schools and cultural and religious institutions of the Carnegie Hill neighborhood and close to many other luxury apartment towers. There are numerous good restaurants and food stores and several movie theaters in the vicinity. It is also close to a post office and a fire engine company and there is considerable traffic in this lively location. The south facade of the tower has an indented center section that is faced with a dark-brown brick in contrast with the rest of the tower's beige-brick facades. 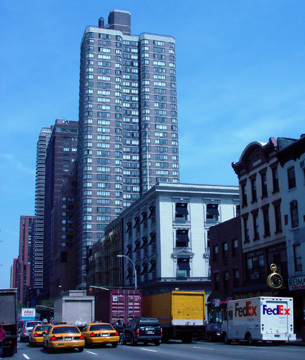 The indentation and the different color brick and the fine proportions of the tower makes it considerably more attractive than some other nearby towers, such as Claridge House at 201 East 87th Street (see The City Review article).